Panorama of the swampland of Carboniferous Scotland 300 million years ago. Although Earth's poles were covered by ice caps, the equatorial regions of the planet were dominated by vast swamp lands during most of the Carboniferous. The Carboniferous period is an interval of about 60 million years defined on the geologic time scale as spanning roughly from 359 to 299 million years ago (mya). The period is noteworthy for its polar glaciation, mountain building, and low sea levels during which in the equatorial regions the land-growing plant life thought to have been geologically transformed into much of the world's coal flourished, while in the extensive shallow seas the remains of abundant algae and zooplankton accumulated in such deep layers on the sea floors that they became the original ingredients baked and compressed to form much of today's recoverable oil and natural gas. In the Carboniferous period—the fifth of six periods making up the Paleozoic era within the Phanerozoic eon—the amniote egg (of a reptile) and also an early ancestor of Conifer trees first appeared. The Carboniferous period lies between the Devonian and the Permian periods. The name for the period comes from the Latin word for coal, carbo, and Carboniferous means "coal-bearing." The Carboniferous coal beds provided much of the fuel for power generation during the Industrial Revolution and are still of great economic importance, providing the fuel to produce much of the world's electricity. The Carboniferous period is divided into two epochs: The Mississippian and the Pennsylvanian with the earlier Mississippian epoch being about twice as long as the later Pennsylvanian epoch. A global drop in sea level at the end of the Devonian period reversed early in the Carboniferous period. This created the widespread epicontinental seas and carbonate deposition forming limestone or dolostone sediments of the Mississippian epoch(Stanley 1999). There was also a drop in south polar temperatures; southern Gondwanaland (or Gondwana) was glaciated throughout the period, though it is uncertain if the ice sheets were a holdover from the Devonian or not. These conditions apparently had little effect in the deep tropics, where lush swamp forests flourished within 30 degrees of the northernmost glaciers. A mid-Carboniferous drop in sea-level is considered to have precipitated the observed major marine extinction, which hit crinoids and ammonites especially hard (Stanley 1999). This sea-level drop and the associated nonconformity in North America separates the Mississippian from the Pennsylvanian periods. The Carboniferous period was a time of active mountain-building, as the component land masses of the supercontinent Pangea came together: The southern continents remained tied together in the supercontinent Gondwana, which collided with North America-Europe (Laurussia) along the present line of eastern North America. This continental collision resulted in the Hercynian orogeny (mountain building) in Europe, and the Alleghenian orogeny in North America (which gave rise to the Appalachian Mountains and Allegheny Mountains). It also extended the newly-uplifted Appalachians southwestward as the Ouachita Mountains (Stanley 1999). In the same time frame, much of present eastern Eurasian plate welded itself to Europe along the line of the Ural mountains. 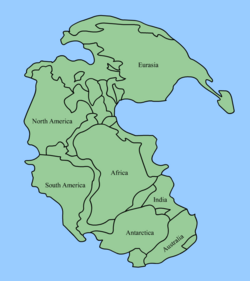 Most of the Mesozoic supercontinent of Pangea was now assembled, although North China (which would collide in the Latest Carboniferous), and South China continents were still separated from Laurasia. The Late Carboniferous Pangaea was shaped like an "O." There were two major oceans in the Carboniferous: Panthalassa, the vast sea surrounding the land mass, and Paleo-Tethys, which was inside the "O" in the Carboniferous Pangaea. Other minor oceans were shrinking and eventually closed: the Rheic Ocean (closed by the assembly of South and North America); the small, shallow Ural Ocean (which was closed by the collision of Baltica and Siberia continents, creating the Ural Mountains), and Proto-Tethys Ocean (closed by North China's collision with Siberia/Kazakstania). Carboniferous rocks in Europe and eastern North America largely comprise repeated stratigraphic sequences known as "cyclothems" in the United States and "coal measures" in Britain. A single cyclothem sequence follows approximately the pattern of sequential beds of limestone, sandstone, shale, and coal, (Stanley 1999). In North America, the early Carboniferous rocks are largely marine limestone, which accounts for the division of the Carboniferous into two periods in North American schemes. Much the world's coal supply originates from the Carboniferous period, while only a much smaller percentage of the world's oil and natural gas originates in that period; most of the oil and natural gas originates in periods closer to the present. Further large deposits of coal are found in the Permian period, with lesser but still significant amounts from the Triassic and Jurassic periods, and with minor deposits of lignite coal from the Cretaceous period and more recently. Photosynthetic organisms (land-growing plants) were the main source of the coal deposits. As plants died, they formed layers of peat, a spongy material. Over time, the peat was covered with sand, clay, and other minerals and turned into sedimentary rock. When the weight of subsequent depositions squeezed out the water, and temperatures rose high enough, the resulting pressure cooker effect yielded coal. The Carboniferous coal beds provided much of the fuel for power generation during the Industrial Revolution and are still of great economic importance. The large coal deposits of the Carboniferous primarily owe their existence to two factors. The first of these is the appearance of bark-bearing trees (and in particular the appearance of the bark fiber lignin). The bark of Carboniferous trees was relatively much thicker than the bark of most of today's trees. The second factor leading toward the formation of coal is the lower sea levels that occurred during the Carboniferous as compared to the Devonian period, which allowed for the development of extensive lowland swamps and forests in North America and Europe. Some hypothesize that the reason large quantities of wood could be buried during this period was because animals and decomposing bacteria had not yet appeared that could effectively digest the new lignin. Some authorities believe that oil in particular traced to tiny diatoms (a type of algae), that fell to the bottom of seas, were buried under sediment, and through pressure and heat turned into oil. The extensive burial of biologically-produced carbon led to a buildup of surplus oxygen in the atmosphere; estimates place the peak oxygen content as high as 35 percent, compared to 21 percent today. The high oxygen level in the Carboniferous probably resulted in insect and amphibian gigantism—a phenomena in which creatures whose size is constrained by their respiratory system being based on internal diffusion of oxygen grew much larger than they are today thanks to the high oxygen environment of the Carboniferous. Marine life is especially rich in crinoids and other echinoderms. Brachiopods were abundant. Trilobites became quite uncommon. On land, large and diverse plant populations existed. Land vertebrates included large amphibians. Early Carboniferous land plants were very similar to those of the preceding Latest Devonian, but new groups also appeared at this time. The main Early Carboniferous plants were the Equisetales (Horse-tails), Sphenophyllales (vine-like plants), Lycopodiales (club mosses), Lepidodendrales (scale trees), Filicales (ferns), Medullosales (previously included in the "seed ferns," an artificial assemblage of a number of early gymnosperm groups), and the Cordaitales. These continued to dominate throughout the period, but during late Carboniferous, several other groups, Cycadophyta (cycads), the Callistophytales (another group of "seed ferns"), and the Voltziales (related to and sometimes included under the conifers), appeared. The Carboniferous lycophytes of the order Lepidodendrales, which are related to the tiny club-moss of today, were huge trees with trunks 30 meters high and up to 1.5 meters in diameter. These included Lepidodendron (with its fruit cone called Lepidostrobus), Halonia, Lepidophloios, and Sigillaria. The Equisetales included the common giant form Calamites, with a trunk diameter of 30 to 60 cm and a height of up to 20 meters. Sphenophyllum was a slender climbing plant with whorls of leaves, which was probably related both to the calamites and the lycopods. Cordaites, a tall plant (6 to over 30 meters) with strap-like leaves, was related to the cycads and conifers; the catkin-like inflorescence, which bore yew-like berries, is called Cardiocarpus. These plants were thought to live in swamps and mangroves. True coniferous trees (Waichia, of the order Voltziales) appear later in the Carboniferous, and preferred higher, drier ground. In the oceans, the most important groups are the foraminifera, corals, bryozoa, brachiopods, ammonoids, echinoderms (especially crinoids), and Chondrichthyes (sharks and their relatives). For the first time, foraminifera take a prominent part in the marine faunas. The large spindle-shaped genus Fusulina and its relatives were abundant in what is now Russia, China, Japan, and North America. Other important genera include Valvulina, Endothyra, Archaediscus, and Saccammina. Some Carboniferous genera are still extant. The microscopic shells of Radiolaria are found in cherts of this age in River Culm of Devonshire and Cornwall, and in Russia, Germany, and elsewhere. Sponges are known from spicules and anchor ropes, and include various forms such as the Calcispongea Cotyliscus and Girtycoelia, and the unusual colonial glass sponge Titusvillia. Both reef-building and solitary corals diversify and flourish; these include both rugose (for example, Canina, Corwenia, Neozaphrentis), heterocorals, and tabulate (for example, Chaetetes, Chladochonus, Michelinia) forms. Conularids were well represented by Conularia. Bryozoa were abundant in some regions; the Fenestellids including Fenestella, Polypora, and the Archimedes, so named because it is in the shape of an Archimedean screw. Brachiopods were also abundant; they include Productids, some of which (for example, Gigantoproductus) reached very large (for brachiopods) size and had very thick shells, while others like Chonetes were more conservative in form. Athyridids, Spiriferids, Rhynchonellids, and Terebratulids were also very common. Inarticulate forms include Discina and Crania. Some species and genera had a very wide distribution with only minor variations. Annelids such as Spirorbis and Serpulites are common fossils in some area. Among the mollusca, the bivalves continue to increase in numbers and importance. Typical genera include Aviculopecten, Posidonomya, Nucula, Carbonicola, Edmondia, and Modiola. Conocardium was a common rostroconch. Gastropods were also numerous, including the genera Murchisonia, Euomphalus, Naticopsis. Trilobites were rare, represented only by the proetid group. Ostracods such as Cythere, Kirkbya, and Beyrichia were abundant. Among the echinoderms, the crinoids were the most numerous. Dense submarine thickets of long-stemmed crinoids appear to have flourished in shallow seas, and their remains were consolidated into thick beds of rock. Prominent genera include Cyathocrinus, Woodocrinus, and Actinocrinus. Echinoids such as Archaeocidaris and Palaeechinus were also present. The Blastoids, which included the Pentreinitidae and Codasteridae and superficially resembled crinoids in the possession of long stalks attached to the sea-bed, attained their maximum development at this time. Freshwater Carboniferous invertebrates include various bivalve molluscs that lived in brackish or fresh water, such as Anthracomya, Naiadiles, and Carbonicola, and diverse Crustacea such as Bairdia, Carbonia, Estheria, Acanthocaris, Dithyrocaris, and Anthrapalaemon. The Eurypterids were also diverse, and are represented by such genera as Eurypterus, Glyptoscorpius, Anthraconectes, Megarachne (originally misinterpreted as a giant spider), and the specialized very large Hibbertopterus. Many of these were amphibious. Frequently, a temporary return of marine conditions resulted in marine or brackish water genera such as Lingula, Orbiculoidea, and Productus being found in the thin beds known as marine bands. Fossil remains of air-breathing insects, myriapods, and arachnids are known from the late Carboniferous, but so far not from the early Carboniferous. Their diversity when they do appear, however, show that these arthropods were both well developed and numerous. Among the insect groups are the Syntonopterodea (relatives of present-day mayflies), the abundant and often large sap-sucking Palaeodictyopteroidea, the huge predatory Protodonata (griffinflies), the diverse herbivorous "Protorthoptera," and numerous basal Dictyoptera (ancestors of cockroaches). Many insects have been obtained from the coalfields of Saarbruck and Commentry, and from the hollow trunks of fossil trees in Nova Scotia. Some British coalfields have yielded good specimens: Archaeoptitus, from the Derbyshire coalfield, had a spread of wing extending to more 35 cm; some specimens (Brodia) still exhibit traces of brilliant wing colors. In the Nova Scotian tree trunks, land snails (Archaeozonites, Dendropupa) have been found. Many fish inhabited the Carboniferous seas; predominantly Elasmobranchs (sharks and their relatives). These included some, like Psammodus, with crushing pavement-like teeth adapted for grinding the shells of brachiopods, crustaceans, and other marine organisms. Other sharks had piercing teeth, such as the Symmoriida. Some, the petalodonts, had peculiar cycloid cutting teeth. Most of the sharks were marine, but the Xenacanthida invaded fresh waters of the coal swamps. Among the bony fish, the Palaeonisciformes found in coastal waters also appear to have migrated to rivers. Sarcopterygian fish were also prominent, and one group, the Rhizodonts, reached very large size. Most species of Carboniferous marine fish have been described largely from teeth, fin spines, and dermal ossicles, with smaller freshwater fish preserved whole. Freshwater fishes were abundant, and include the genera Ctenodus, Uronemus, Acanthodes, Cheirodus, and Gyracanthus. Carboniferous amphibians were diverse and common by the middle of the period, more so than they are today. Some were as long as 6 meters, and those fully terrestrial as adults had scaly skin (Stanley 1999). They included a number of basal tetrapod groups classified in early books under the Labyrinthodontia. These had long bodies, a head covered with bony plates and generally weak or undeveloped limbs. The largest were over 2 meters long. They were accompanied by an assemblage of smaller amphibians included under the Lepospondyli, often only about 15 cm long. Some Carboniferous amphibians were aquatic (Loxomma, Eogyrinus, Proterogyrinus); others may have been semi-aquatic (Ophiderpeton, Amphibamus) or terrestrial (Dendrerpeton, Hyloplesion, Tuditanus, Anthracosaurus). One of the greatest innovations of the Carboniferous was the amniote egg, which allowed for the further exploitation of the land by certain tetrapods. These included the earliest Sauropsid reptiles (Hylonomus), and the earliest known Synapsida (Archaeothyris). These small lizard-like animals quickly gave rise to many descendants. The amniote egg allowed these ancestors of all later birds, mammals, and reptiles to reproduce on land by preventing the desiccation, or drying-out, of the embryo inside. By the end of the Carboniferous period, the reptiles had already diversified into a number of groups, including protorothyridids, captorhinids, aeroscelids, and several families of pelycosaurs. Because plants and animals were growing in size and abundance in this time, land fungi diversified further. Marine fungi still occupied the oceans. Dudley, R. 1998. Atmospheric oxygen, giant Paleozoic insects and the evolution of aerial locomotor performance. Journal of Experimental Biology 201: 1043-50. ICS (International Commission on Stratigraphy). 2004. Geologic Time Scale 2004. Retrieved September 19, 2005.